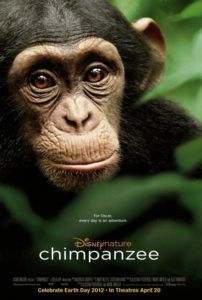 Chimpanzee lives up to the name of its distributor, Disneynature, by supplying a family-friendly dose of the natural world. 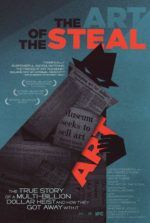 Made with the same visual luster of their previous projects (Earth, Oceans, and African Cats), this nature documentary takes alarming steps away from pure documentation and approaches a full-fledged narrative. 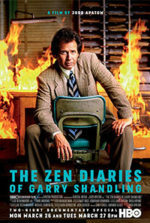 With Tim Allen providing hammy voiceover, audiences are subject to something dangerously close to Homeward Bound, where the animals on display are no longer subjects but characters, each given cutesy names and the footage of them edited so that we might project human traits upon them. And while the behavioral marvels caught on camera in Chimpanzee are undeniable, there’s far too much trivialization of these animals to revere the overall film. Fortunately, seeing the film on opening weekend has its benefits: Disneynature donates a portion of every ticket to help save chimpanzees through the Jane Goodall Institute. After directing The Blue Planet and Planet Earth for television, Alastair Fothergill and Mark Linfield team up once more and capture some spectacular wildlife footage. Aerial views taken high above the rainforest canopy translate with a dramatic clarity and beauty. The film’s opening shot is a stunner: a panoramic image of a fog-covered rainforest that’s so vast it looks almost unreal. From here, the crew’s near proximity to an “extended family” chimpanzee group allows for intimate close-ups and immerses the audience. But the more terrific visual splendors result from time-lapse photography, a frequent and wowing device used by the filmmakers. The accelerated footage shows insect and fungal life moving so fast that we might see a whole life cycle within a matter of moments. Another sequence, this one extreme slow-motion, shows massive raindrops striking large fungi puffballs that eject a cloud of spores when hit. A night scene finds bioluminescent fungi glowing green like something out of Avatar. These are among the most memorable moments in the film. The story follows a young chimp the filmmakers have named Oscar. We watch for the first two-thirds of the film as his mother raises him within a peaceful, tightly-knit chimpanzee unit in the jungles of the Ivory Coast and Uganda. In opposition is an all-male band of jungle marauders, ruthless chimps led by a villainous boss the filmmakers have named Scar (not voiced by Jeremy Irons). As the two groups move throughout the forest, looking for food, we see them gather nuts and hunt for monkeys. Oscar’s group, led by Freddy, uses a clever pack hunting trick to capture prey, but the filmmakers cut away at just the right moment to preserve the integrity of the heroes. When Scar’s group attacks, Oscar’s mother dies and the young child is all but ostracized from the group. Slowly, Oscar forms a bond with his group’s Alpha Male; a rare and unlikely event in Nature occurs when Freddy adopts Oscar as his own. Oscar goes from being an outcast to the prince of his group. While these real-life events are endearing, the big problem here is the narration—not only how it’s delivered but how it’s written. Allen’s voice doesn’t command the way James Earl Jones, Pierce Brosnan, or Samuel L. Jackson’s voices have in past Disneynature docs. Allen’s aural presence isn’t one of scientific observation, but one that helps to emphasize the chimps’ human qualities. He’s speaking to the lowest common denominator, and their children. In one scene, where chimps are attempting to crack nuts with a rock, Allen resorts to grunting Home Improvement-style. Some people in the audience laughed at this moment, while others just felt embarrassed. During moments where Freddy’s group is attacked by Scar’s, Allen simply yells at us through the fracas, making the moment feel harsh on our ears as well as eyes. Worse, consider how the opening is edited: Set to a swingin’ jungle boogie, we see young chimps scamper about the trees and stumble in their play; the editors then cut to the elder chimps, who gesture in a way that recalls a human shaking their head in mortification. In actuality, these two moments probably had nothing to do with one another, but the filmmakers have opted to give chimpanzees wholly human qualities through the device of film. They do this rather than teaching us anything about actual chimps, about their group mentality; instead, here is another lesson in the bonds between parent and child courtesy of Disneynature. One wishes the filmmakers had enough faith in the heartwarming story they captured to trust the power of the images alone. Had the cutesy, ersatz-human mannerisms been removed, this might’ve been a breathtaking experience. Perhaps on home video audiences can mute the volume and enjoy. Unlike Fothergill’s last, similarly themed doc for Disneynature, African Cats, the family-friendly narration in Chimpanzee overwhelms the footage and cheats the viewer out of a truly edifying documentary experience. Instead, we come away rooting for Oscar and his family and feeling as though Scar and his “gang” are the demons of the rainforest. In all reality, there are no “good guys” or “bad guys” in Nature, and so Disney has done environmentalists a disservice by attempting to personify and implant a narrative structure into wildlife. 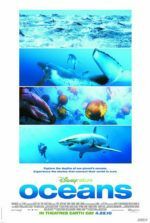 Granted, children will enjoy the bright colors and Allen’s kitschy sense of humor, but anyone serious about protecting wildlife could make the argument that Disney is doing more harm than good with this film. Of course, the strength of that argument depends largely on the opening weekend box office, and how many millions Disney ends up donating to the chimpanzee cause. Either way, the conflicts around these Disneynature docs are growing with each new film and moving further away from what should be the wonderment of Nature in its usual state—as opposed to some human-projected storybook complete with heroes, villains, and a happy ending.